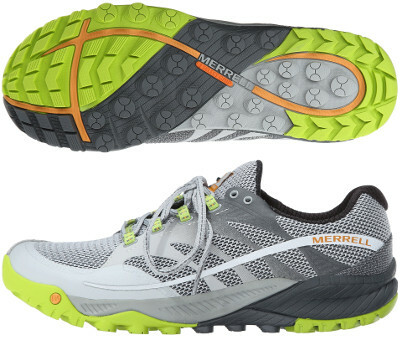 Merrell All Out Charge are neutral trail running shoes. The all-road Merrell All Out Charge is placed between fast All Out Terra and ultra All Out Peak within "All Out" trail collection from the american brand. Enough cushioning for middle and long distances combined with a good response (just 6 mm drop) make the All Out Charge a versatile trail running shoe although grip on slippery and rocky terrains has room for improvement. Removable insoles allow runners to use custom ones and as many other shoes from Merrell, the All Out Charge has been manufactured without animal products so it is vegan friendly. Upper from All Out Charge is typical Merrell: visually attractive, plenty of high quality materials and features a snug but comfortable fit. Synthetic overlays (HyperWrap 360™) over breathable, double layer mesh wrap midfoot to provide a secure fit while reflective details (including full length external strip) increase visibility under poor light conditions. Toe cap has been reinforced to better protect against external elements and oversized midsole wall provides improved stability. Midsole is based on two different density foams: harder one named UniFly™ (EVA) for reliable cushioning and a softer one for more comfortable run. There is no plate in the forefoot to protect against sharp objects and outsole is not from Vibram® but made of own rubber (M Select™). Lug pattern provide great traction (besides muddy grounds) and grip needs to improve on slippery and rocky terrains.